Schrock Insurance Group’s ongoing community enrichment program initiates a new charity campaign in collaboration with nonprofit organization Winning Futures, in support of student mentoring programs which positively impact the journey to successful adulthood. Winning Futures helps provide brighter futures for so many kids. We hope our campaign will bring greater awareness to this amazing group, both with fundraising and with the recruiting of mentors for summer and fall. Schrock Insurance Group of the north Detroit metro area celebrates the beginning of the latest charity campaign in their ongoing Agents of Change community involvement program. Winning Futures is a nonprofit group which provides mentoring and support programs for middle and high school students. Donations to this valuable community resource are now being accepted at: http://www.winningfutures.org/donate/. Winning Futures was founded in 1994 by Sam Cupp, a local entrepreneur who felt his success was largely due to the help he had received from two people, a teacher and a businessman, who had worked together to mentor him. Sam wanted to give back to the community by creating a program which would do the same for other students. His first mentee is now the award-winning nonprofit’s president and CEO. 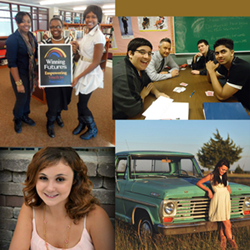 Offering school-based mentoring programs and workshops for middle and high school students in southeast Michigan, Winning Futures strives to make a real difference in the lives of young people with programs which focus on life skills such as character, self-reliance, goal setting, career preparation and strategic planning. Their goal is to inspire kids with caring adult mentors who will help guide them on their journey to successful adulthood. The team at Schrock Insurance Group is hard at work mobilizing support for Winning Futures among their network of professional and personal contacts, inviting them to actively participate not only contributing financially, but also by helping spread the word to others in their own circles of influence. The cause is also featured in the agency’s monthly magazine, which is delivered to thousands of households in Ferndale, Farmington Hills and the greater north Detroit area. The electronic flipbook version of the current issue of Our Hometown magazine may be accessed at: http://www.schrockinsurancegroup.com/Our-Hometown-Magazine_41. All those who donate a minimum of $5 will be acknowledged in a future issue of Our Hometown. Committed to raising as much money as possible, the agency itself has pledged to donate $10 to Winning Futures for each and every recommendation they receive for an insurance quote, with no purchase necessary, making it simple for everyone to stand behind the area’s teens. Readers who wish to view the campaign, recommend a friend and/or make a personal donation may do so here. Schrock Insurance Group will continue to seek out new ways to support the local community, promising to unveil a new campaign every two to three months. Concerned members of the community may submit ideas for future initiatives here: http://www.schrockinsurancegroup.com/Add-Community-Cause_48. To view past causes, please visit: http://www.schrockinsurancegroup.com/community-cause. More information about the agency is available at: http://www.schrockinsurancegroup.com/. A full service, award-winning provider serving families of northern Detroit from offices in Ferndale and Farmington Hills, MI, Schrock Insurance has one simple mission: to provide the finest insurance and financial products in the industry, while delivering consistently superior service. Nicholas Schrock and his dedicated team of professionals focus on helping clients to protect the things which are most important to them (their families, homes, cars and more) and on developing strategies to fulfill long-term financial goals. Their caring experts may be reached by calling 248-987-5730 (Farmington Hills) or 248-547-4010 (Ferndale).